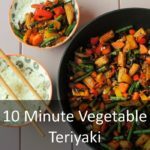 A tasty vegetable packed dish that could rival your local delivery service can be just 10 minutes away with this 10 minute vegetable teriyaki. Chop all of the vegetables and add to a oiled pan and gently cook for 7 minutes. Mix together the rest of the ingredients for the sauce and after the vegetables have cooked, add the sauce, stir and gently cook for a further 2 minutes. Cook the Veetee rice in the microwave for 2 minutes and serve with the vegetable teriyaki.